Experience the sights and sounds of the Bible at Florida's most unique park. As you step through the turnstiles of The Holy Land Experience, you'll travel back in time 2000 years to the far off city of Jerusalem in ancient Israel. Prepare to be amazed by spectacular recreations that bring the Bible to life through realistic architecture and presentations that not only entertain, but teach about this magical time. As you enter the park you're immediately thrown into the mix at the Jerusalem Street Market. It's there that you'll come face to face with artisans and shopkeepers who are more than willing to tell you all about life in ancient Jerusalem. Nearby, children are easily entertained in their own interactive Smile of a Child Adventureland, where they can enjoy a 15 minute presentation of the Parables of Jesus in the Smile of a Child Theater, craft stations, and a rock climbing wall. One of the highlights of your visit is sure to be the amazing 45 foot by 25 foot long model of ancient Jerusalem — the largest indoor model of its kind. Daily presentations retell the history of the city — from its beginnings as King David's capital city to its destruction by the Romans. See where Christ walked as He ministered and where He traveled during His final hours leading up to His crucifixion. An especially moving experience are the six live performances presented multiple times throughout the day. You can follow the entire story of Saint Peter, in a four-part series called "God with Us." Each will put you right in the middle of the action— you'll feel like a witness to this important part of history. At the far end of the park, a vast display of Biblical artifacts in the Scriptorium provides an informative walk-through tour featuring the Van Kampen Collection that consists of several thousand manuscripts, scrolls, and other religious artifacts. Among other highlights is a replica of the mobile Wilderness Tabernacle, where the Israelites worshiped during their 40 years of wandering in the desert. It is here that you will learn about the object inside the Tabernacle and the Ark of the Covenant. If you enjoy Christian music, you won't want to miss "Celebrate Jesus" karaoke, where you can actually stage your talent and sing praises to Jesus. If you're visiting with kids be sure to sign them up for Roman Soldier Training Camp, a hand-on experience where they'll ready for combat with the Roman army. The Holy Land Experience is open Tuesday through Saturday 10:00 a.m. until 6:00 p.m., except Thanksgiving Day, Christmas Day, and New Year's Day. The park is closed on Sundays and Mondays, except for special events. Hours may vary by season, so check the hours of operation calendar. There are several dining experiences awaiting guests throughout the park, from the Esther's Banquet Hall, where you will find a full menu of chef or daily specials, to Last Snack where you can grab a hot dog right outside The Scriptorium. A variety of snacks are sold at Martha's Kitchen and The Church of All Nations Bistro — including giant pretzels, ice cream, or a sandwich. There is also a coffee shop that offers coffee, espresso, cappuccino, latté or iced specialties. Those wanting a souvenir of their trip can find unique gifts, art, postcards, clothing, books and more at Solomon's Treasures, Gold, Frankincense, & Myrrh Shop, and the Ex Libris Book Shoppe. Bibles, reference, and study materials, biographies, and educational posters are also available. Forgot someone on your gift list? There are a limited number of items available online. Tickets may be purchased online. Single-day online admission prices are $50 for adults, $35 for children ages 5-17. Children under age 4 are admitted free. Two-day admission is also available from $30-$75. Tickets are good for up to one year from purchase date. Tickets purchased at the gate are the same price. Parking is free! Backstage tours are available as well for an additional $10 per tour. The backstage tours are designed to give visitors a glimpse of what it's like running the park. On the Wardrobe Tour and Tech Tour, visitors will see what goes into putting on all of the award-winning dramas from the backstage lighting to what goes into each costume the actors wear. The Tabernacle Tour takes visitors inside the Tabernacle and explains all about its uses and religious significance. 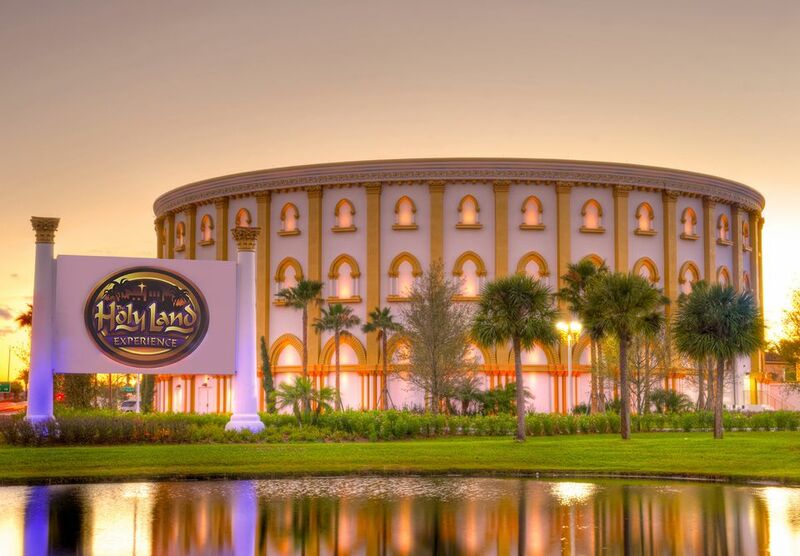 The Holy Land Experience is located at 4655 Vineland Road in Orlando — off Interstate 4, at Exit 78, at the corner of Conroy and Vineland Roads. Take I-4 East or West to Exit 78. Turn west onto Conroy Road, turn right onto Vineland Road. The entrance to The Holy Land Experience is on the right.